For many people around the world, New Year was a time of celebration and joy, but for some it was quite the opposite. Stabbings, mortar shelling, massive fires and a fatal stampede all hit seasonal revels, causing havoc and heartbreak. At least 36 people were killed in China’s Shanghai on New Year’s Eve in a stampede, city authorities said. It was later reported that they rushed to pick up what turned out to be fake US money bills thrown from a building in Chen Yi Square in the city’s Bund waterfront district. An eyewitness said the coupons, which looked like banknotes, were thrown from a bar above the street as part of the New Year’s celebration. "It's too cruel. People in front of us had already fallen to the floor, and others were stepping all over them," said another witness, Cui Tingting, 27, who had picked up some of the coupons. However, local police denied that the fake money was the cause. President Xi Jinping ordered the Shanghai city government to conduct a swift investigation into the tragedy. Afghanistan is not among the countries celebrating western New Year, but it had its share of tragedy. For reasons that were not immediately clear, the Afghan army mortar shelled a wedding party in southern Helmand, killing dozens of guests. With hundreds of guests, many of them women and children, present, the attack turned to be pretty deadly. At least 26 people were killed on the spot while more than 40 sustained injuries and were rushed to hospital. "What we know so far is that our soldiers fired mortar rounds from three outposts but we do not know whether it was intentional," General Mahmoud, deputy commander of the Afghan 215 Corps in the province, told Reuters. Helmand province is one of Afghanistan’s most troubled, with Taliban fighters regularly clashing with government security forces. A tragedy occurred on New Year’s Eve in France’s St Catherine, in the north of the country. A 45-year-old male nurse brought a shotgun to a family party and killed three guests, including his former girlfriend. Two others were injured, one of them seriously enough to be taken to hospital for intensive care. The assailant then drove away in his car and was chased by police. The man eventually turned the firearm on himself, local authorities said. The killing spree came as a shock to the usually quiet French community, AFP reported. “This is a very quiet, peaceful area – there is never any trouble. We are all in a state of absolute shock. You just don’t expect this kind of thing to happen over the holidays,” one local resident said. The nurse’s name was not reported, but he is said to have a history of domestic violence. One person died and several others were wounded after a pub in Plymouth, south west England, was attacked by a man or men wielding an axe and a knife. Police were called at approximately 01:30 GMT. Two men, aged 20 and 21, have both been arrested on suspicion of murder. A 27-year-old died on-site and two of the attack’s victims have been hospitalized after suffering stab wounds. Police have requested that witnesses to come forward to aid with the investigation. Hundreds of shanty dwellings in a slum in the Philippines' capital, Manila, have been destroyed by a huge fire, which is believed to have been started by firecrackers set off by children during New Year celebrations. 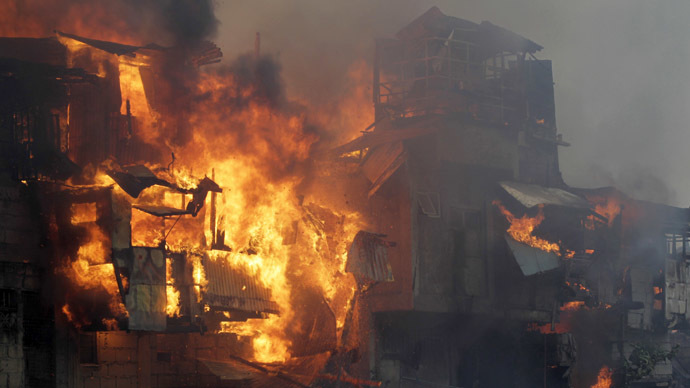 The fire erupted after dawn and was quickly spread by strong winds through a nearly kilometer-long row of shanty dwellings stretching along a creek, AP reported. The agency didn’t say whether there were any casualties in the blaze. Slum residents were trying to save their possessions and pets as the flame was spreading. Some used makeshift floating devices to cross the creek. Firefighters had problems responding to the emergency as their vehicles found it difficult to navigate the narrow passages of the slums. "It's really a tragic way to welcome the New Year," said Noel Carino, a local official. At least 14 fires were reported across the Philippines on New Year's Eve night, two of them killing a total of seven people, a firefighting official told the media. Thousands of residents were displaced after their homes were destroyed or damaged. European revelers are no more immune to consequences of reckless firework displays than their Asian counterparts. At least 102 people were injured in Italy by fireworks and firecrackers during the New Year’s Eve celebration, La Repubblica newspaper reported. The southern region of Campania was hit from fireworks, with 71 injuries reported to medics. In Naples, a 10-year-old boy was hurt as he was setting off fireworks. The number of casualties is expected to rise as information from across the country is being compiled. Last year, some 350 Italians were injured by fireworks.